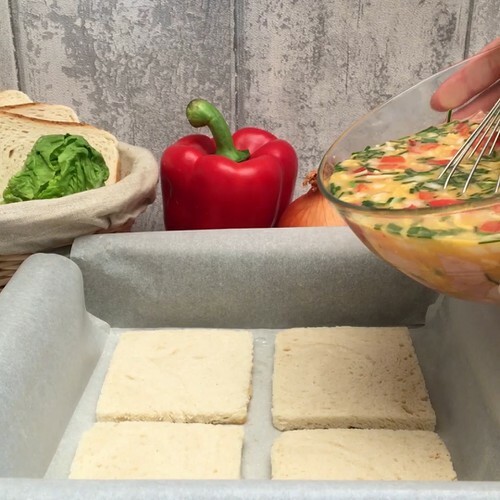 Place the sheets of baking paper across each other in the baking tin, and place the slices of bread with crusts removed at the bottom of the tin. Beat the eggs in a bowl and season with salt and pepper. Stir in the diced red pepper, chopped onion, chopped ham, chopped chives and both grated cheeses. Pour the mix into the baking tin. Bake for 20 minutes at 180°C. After baking, cut the quiche into 8 triangles. Enjoy either hot at home or cold on the go. You choose! © Copyright 2019 ChefClub Network. All rights reserved.